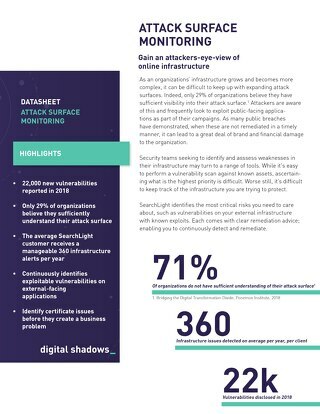 Learn how Digital Shadows monitors, manages, and remediates cyber threats to your business. 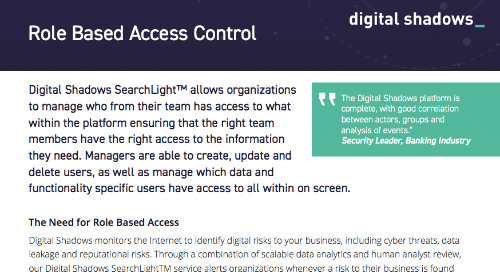 Learn how our role based access control works within Digital Shadows SearchLight™ in this datasheet. Streamline remediation of phishing threats that could impact your company’s revenue and brand reputation. 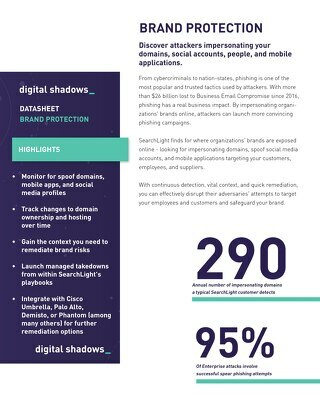 Digital Shadows minimizes digital risk by identifying unwanted exposure and protecting against external threats. 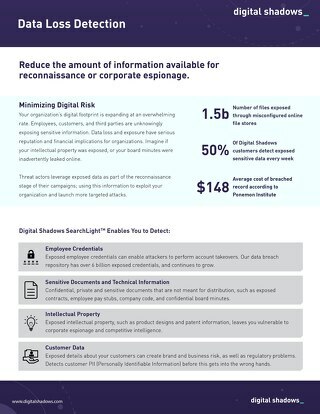 Digital Shadows SearchLight™ helps you minimize these risks by detecting data loss, securing your online brand, and reducing your attack surface. 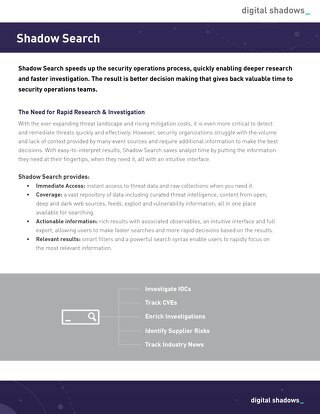 Shadow Search speeds up the security operations process, quickly enabling deeper research and faster investigation for threat intelligence and security teams. 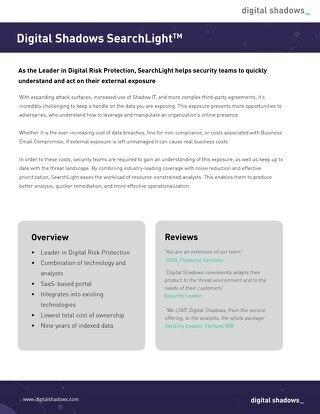 The most comprehensive approach to digital risk management. Our Managed Takedown Service provides customers end-to-end management of submitting, chasing, and confirming takedown requests across all available risk categories. 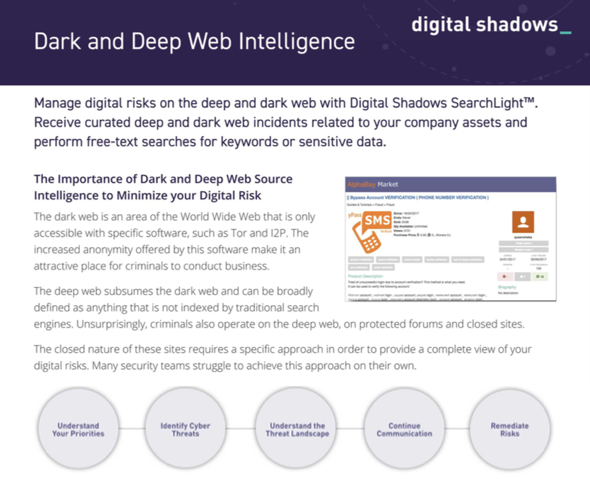 Learn the importance of Dark and Deep Web Source Intelligence to Minimize your Digital Risk. 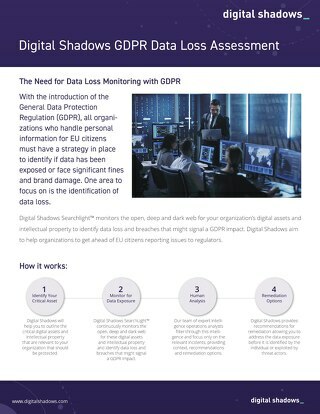 Learn the benefits of the Digital Shadows GDPR Data Loss Assessment. We aim to help organizations get ahead of EU citizens reporting issues to regulators. 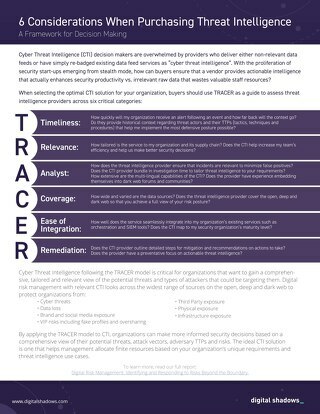 When selecting the optimal Cyber Threat Intelligence solution for your organization, use this guide to assess threat intelligence providers across 6 critical categories. We analyze the code of each mobile application to assess what threat it poses to your customers and your organization. 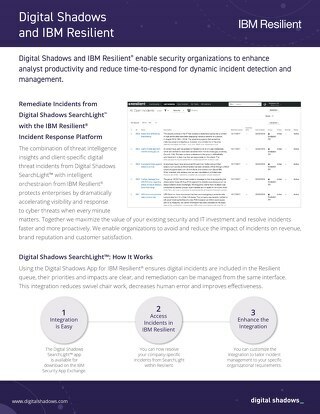 Digital Shadows and IBM Resilient enable security organizations to enhance analyst productivity and reduce time-to-respond for dynamic incident detection and management. Learn about the integration between Splunk Enterprise and Digital Shadows. 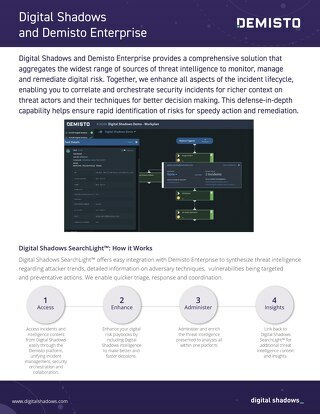 Digital Shadows and Demisto Enterprise provides a comprehensive solution that aggregates the widest range of sources of threat intelligence to monitor, manage and remediate digital risk. Learn about the integration between Phantom Cyber and Digital Shadows. 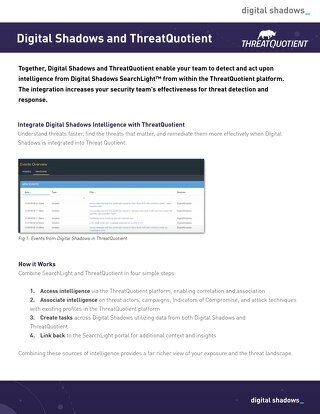 Learn about the integration between ThreatQuotient and Digital Shadows.